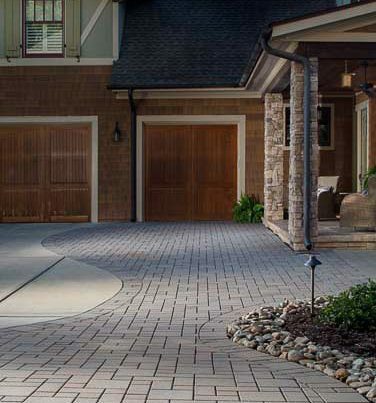 *An authorized Belgard® paver installer is required to provide a 5-year warranty for all paver and wall installations. 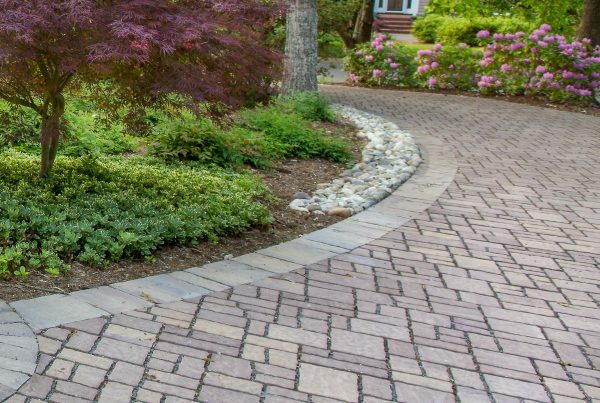 The certified design consultants at DeSignia can create an elegant and stylish paver patio or walkway to set the stage for a beautiful landscape. 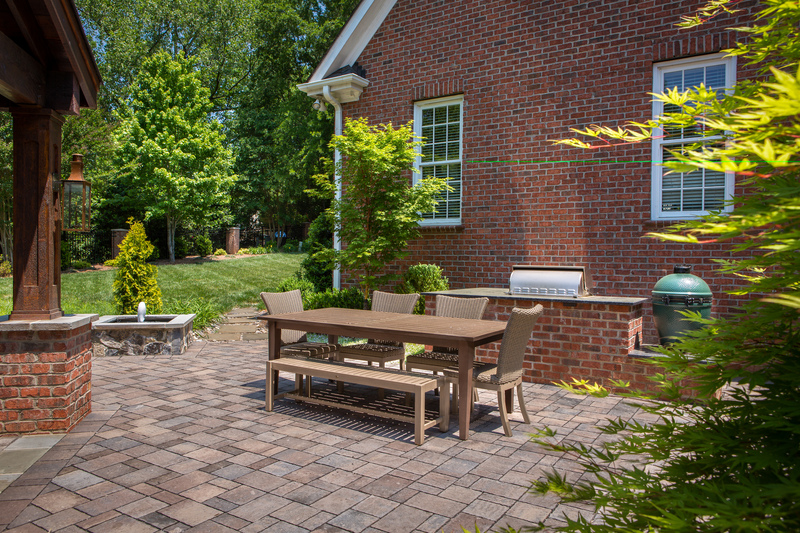 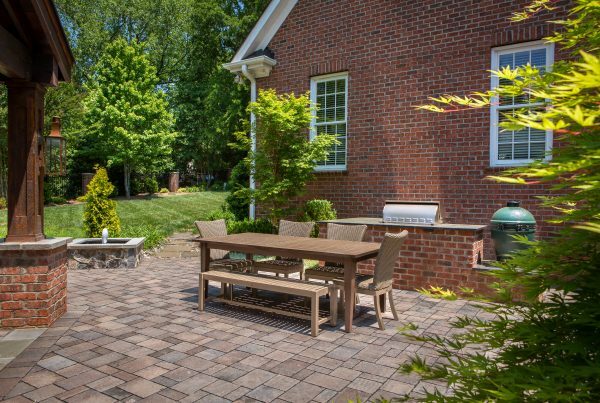 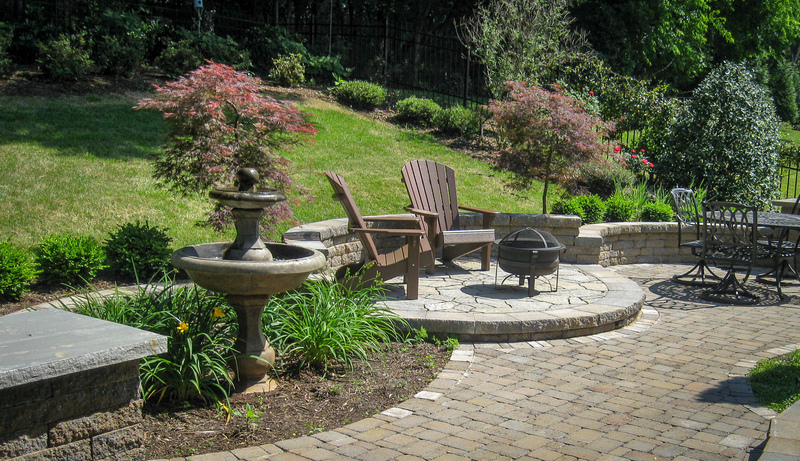 Pavers remain the most cost-effective way to create an elegant and useful patio space. 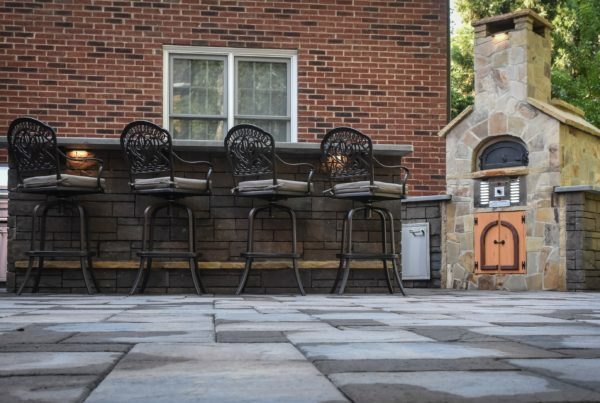 The technology used in creating pavers with a natural stone look and feel is so advanced, clients are amazed at the result. 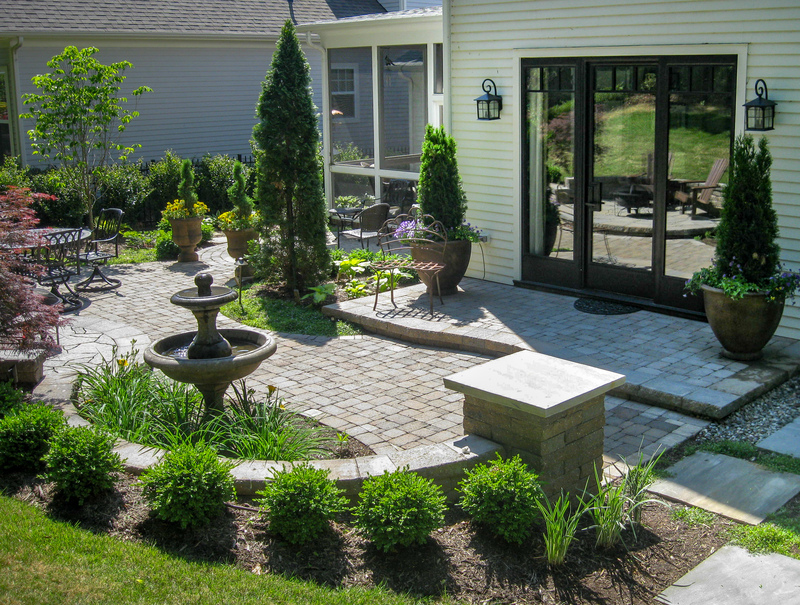 The shape of a patio is a major design criteria that sets the stage for the entire surrounding landscape. Creating a patio shape and style that compliments the architecture of the home is a non-negotiable design criteria for our professional designers. 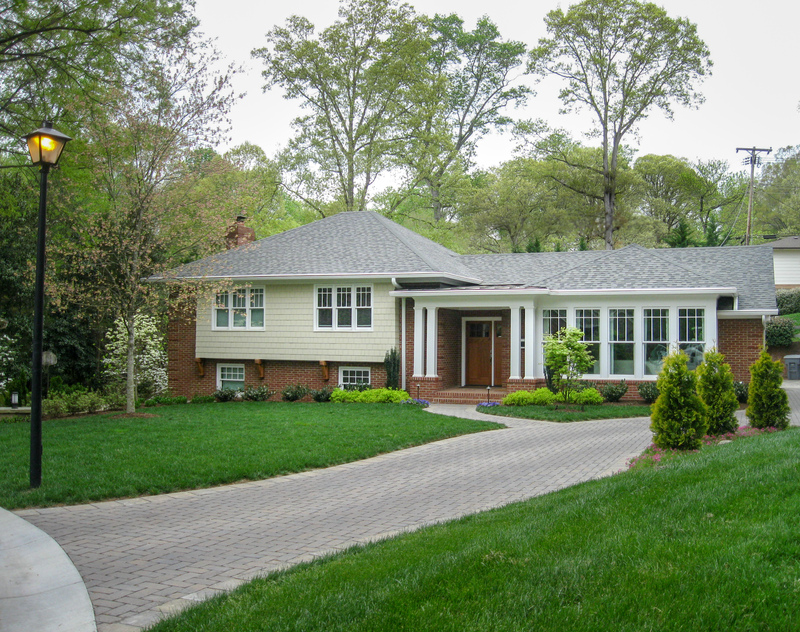 Ensuring that the space is used efficiently is one way that our design team creates efficiency in your landscape. 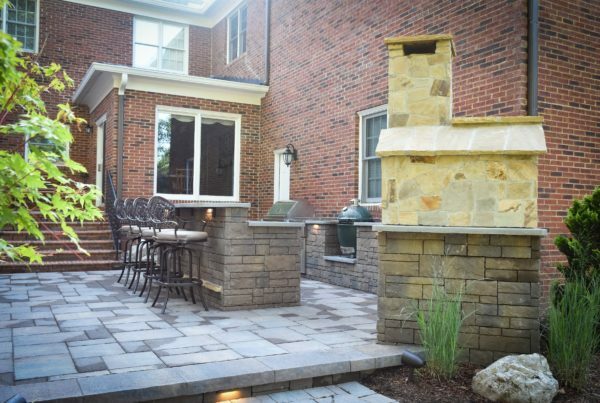 A well-designed patio becomes an extension of your indoor living space. 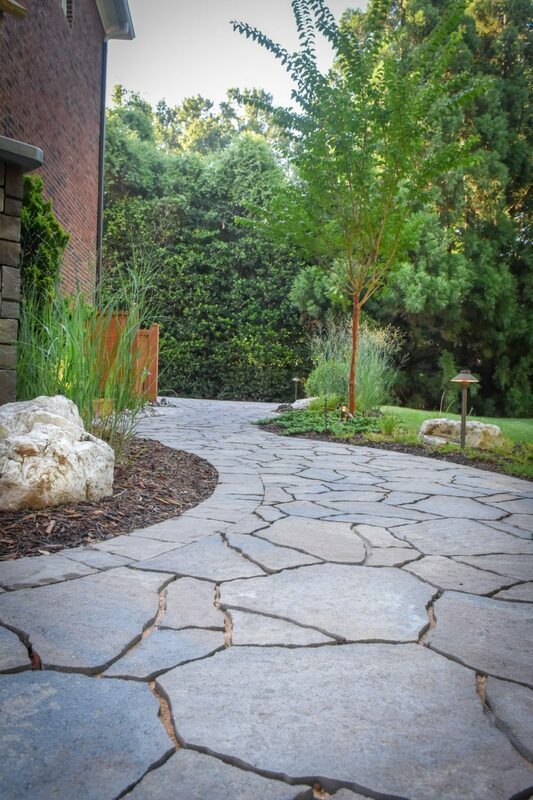 Adding the element of natural stone brings nature closer to home. 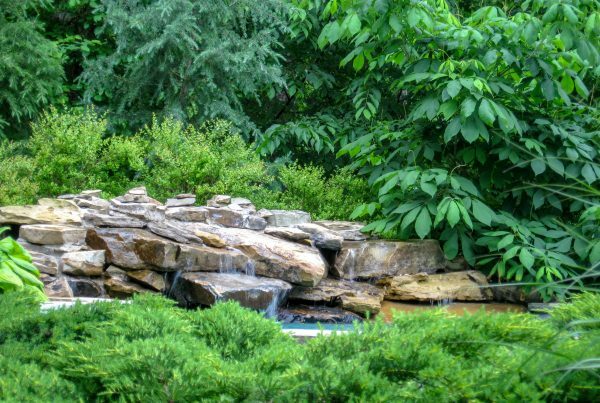 Something about the relationship between plants and rock is so basic to life that including it in the landscape is almost a necessity. 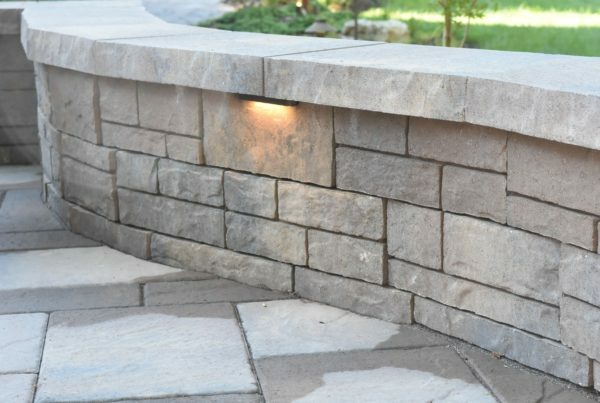 From flagstone patios and walkways, fieldstone walls and pillars, to stacked stone planting beds and fire pits, natural stone is always a welcome addition. 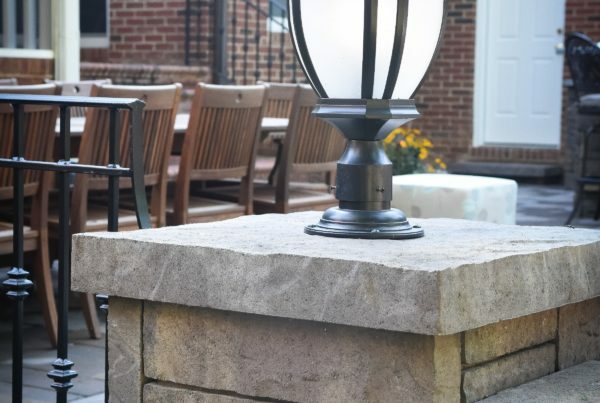 At DeSignia, using natural stone products for something as intimate as a garden hideaway, or as grand as a landscape masterpiece, is a great way to add rustic appeal. 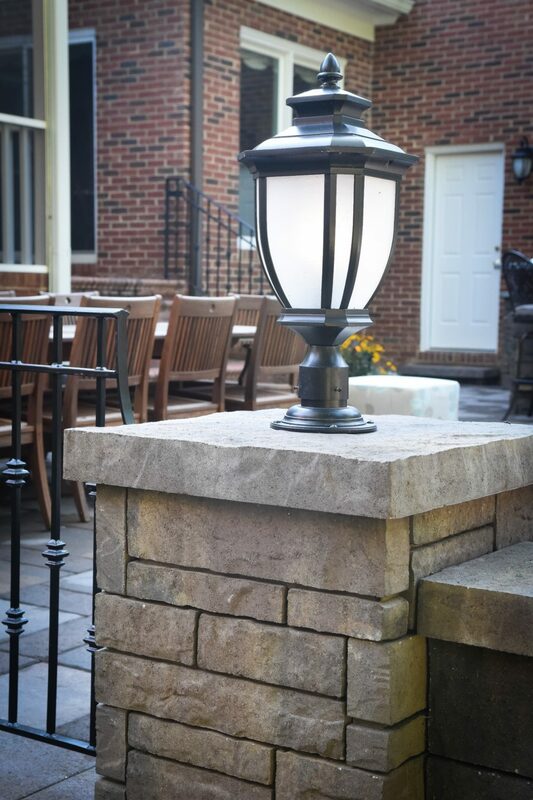 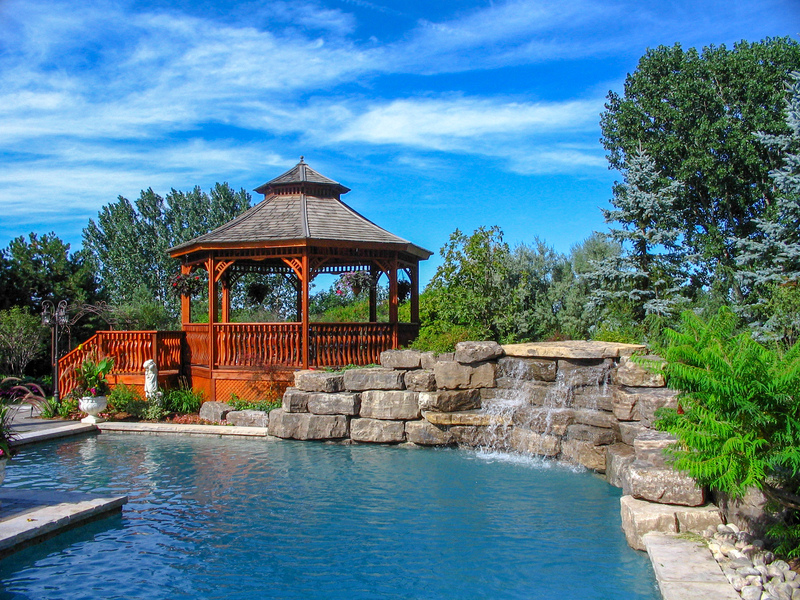 Natural stone products are second to none for representing timeless strength and beauty. Natural stone adds a natural cleanliness, durability and beauty to your home. 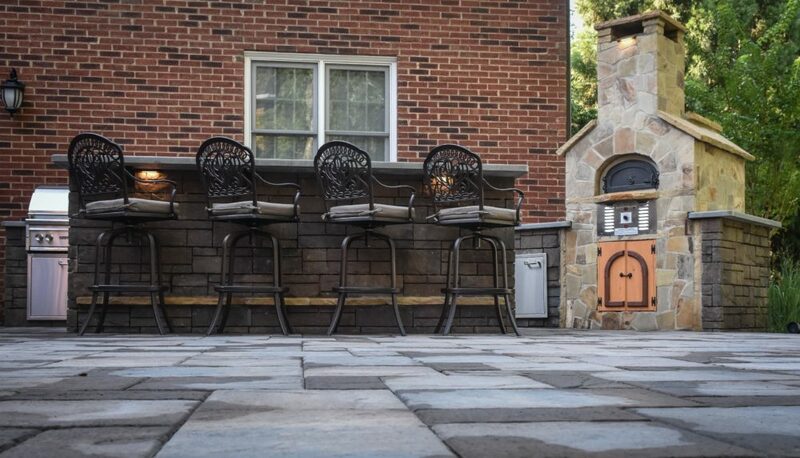 Whatever your taste, DeSignia can provide you with a vast choice of colors featuring natural stone from Tennessee and Pennsylvania. 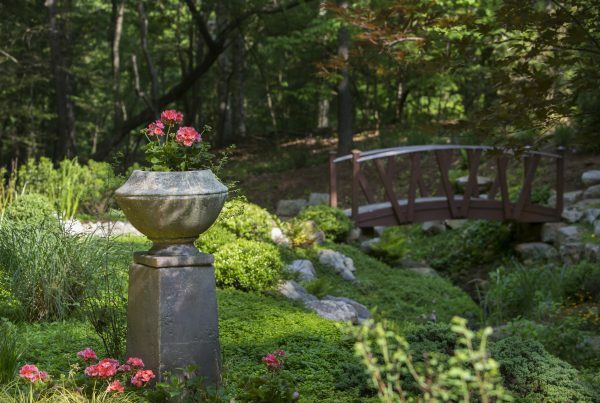 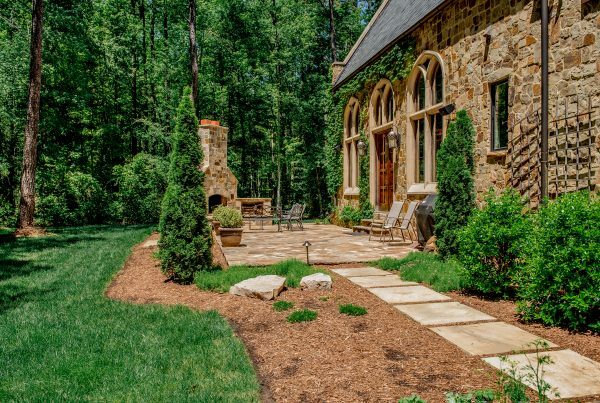 Our experienced and certified design consultants can help transform your landscape project into a naturally timeless outdoor masterpiece. 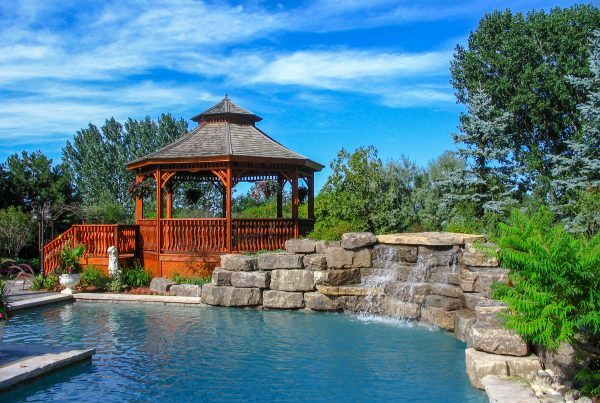 Having reliable access to your home’s entrances, garden shed, garage, and other areas brings a sense of completeness to the landscape. 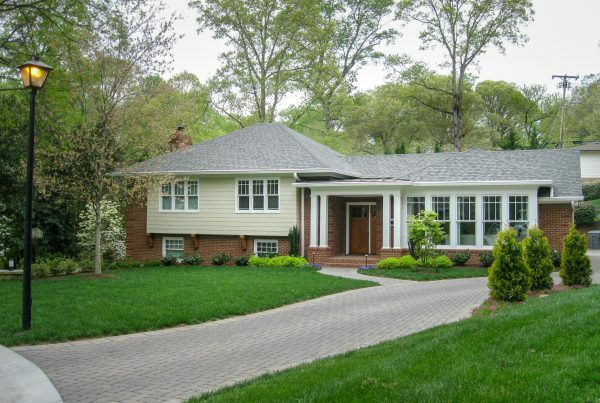 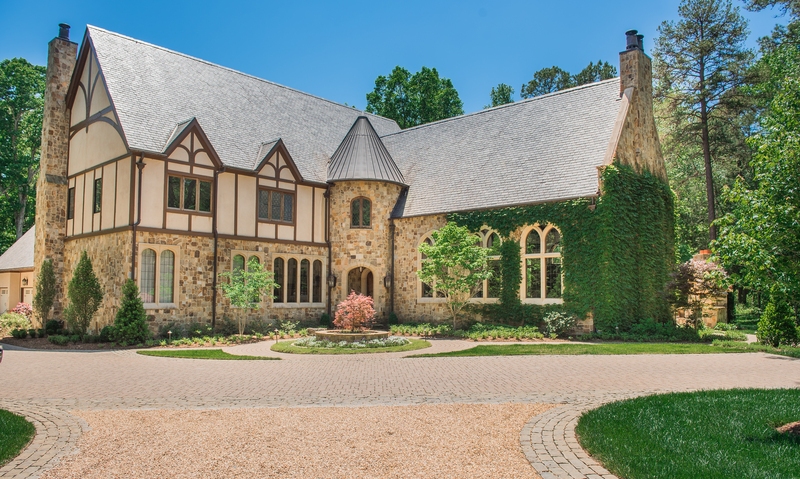 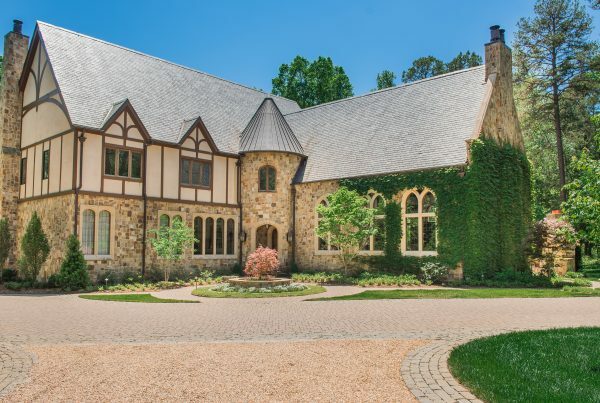 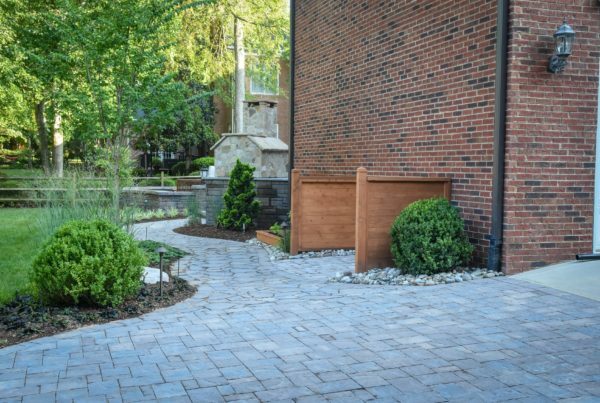 Using the building’s architecture as a guide, our designers can custom tailor a concrete paver or a natural stone walkway or patio that will set the stage for a beautiful landscape and entertainment area. 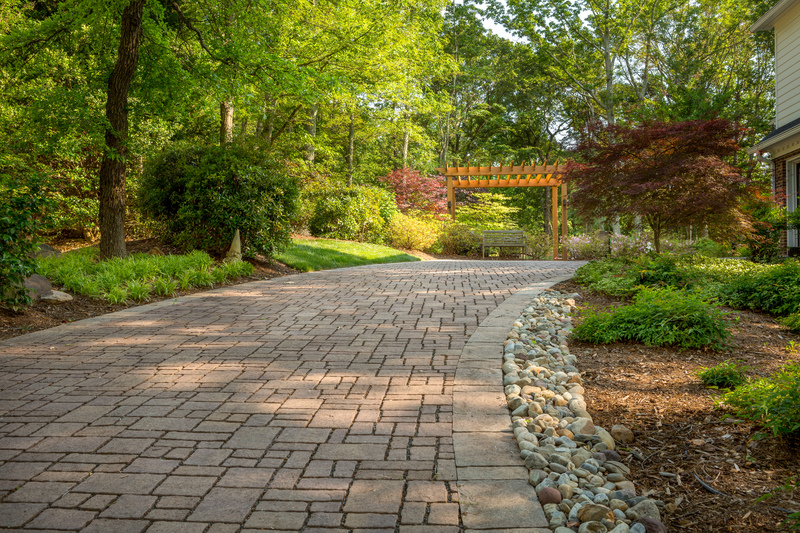 A stepping stone pathway is a cost-effective way to gain access to those less frequented areas. 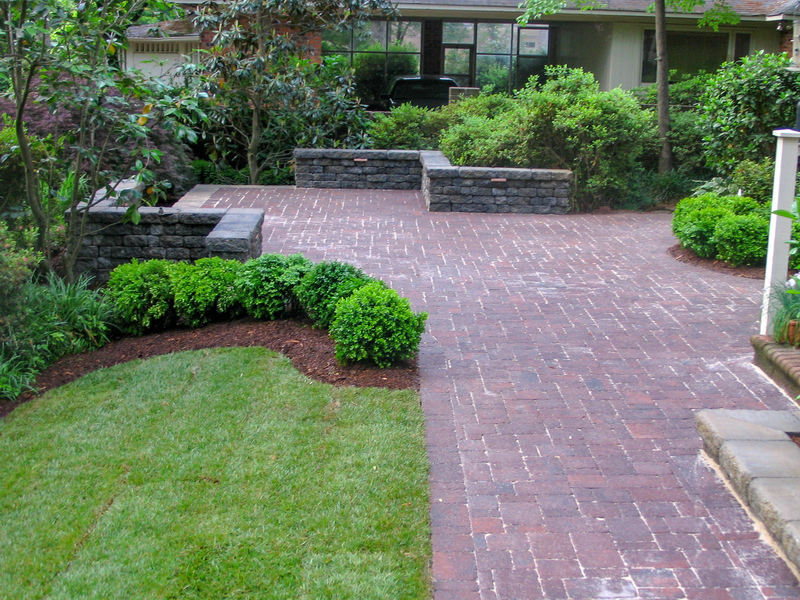 Stepping stone walkway designs are frequently used when a subtle walkway access is needed in the design. 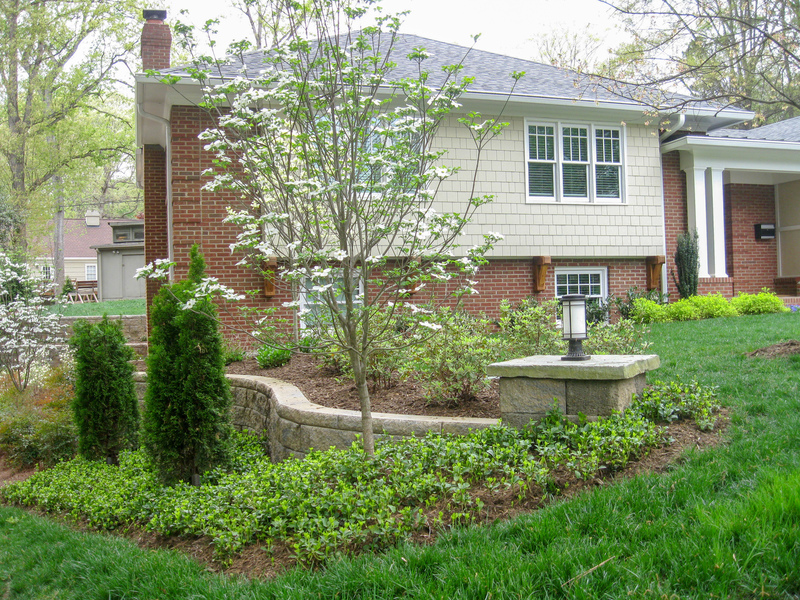 Are elevations a challenge? 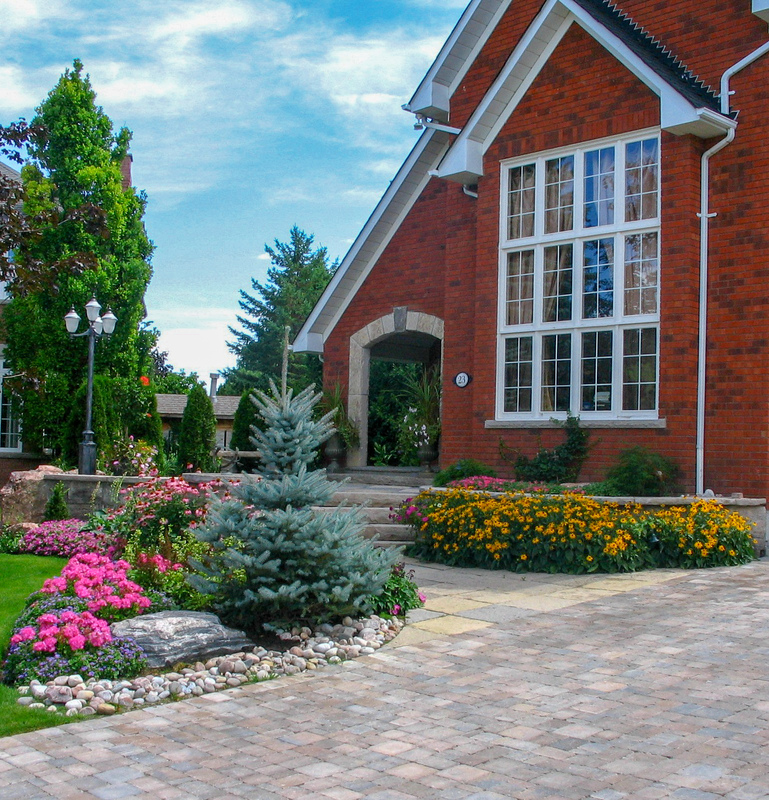 Most clients are amazed at the different step options that are available today. 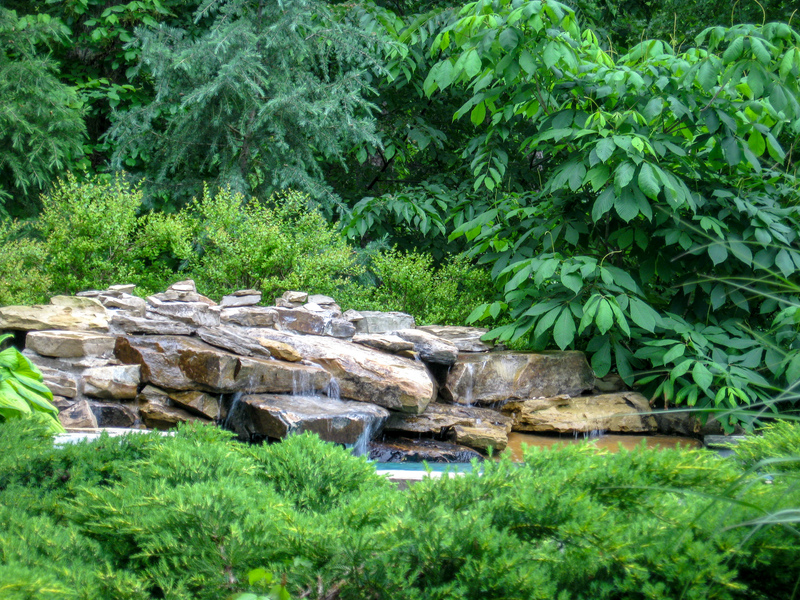 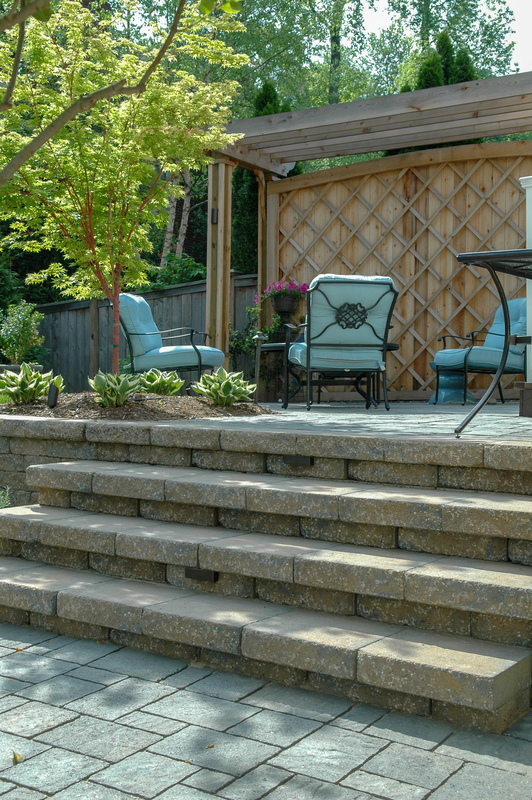 DeSignia can engineer steps to be an integral part of the landscape design. 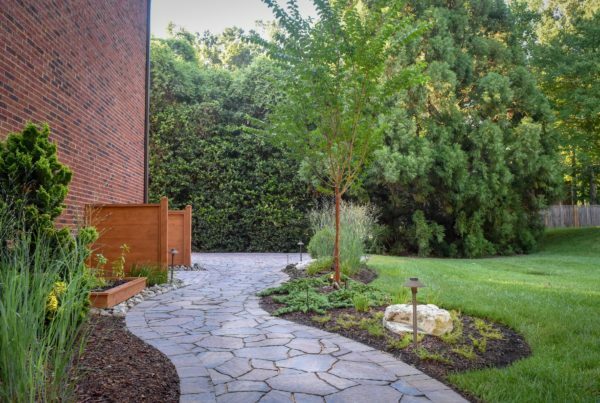 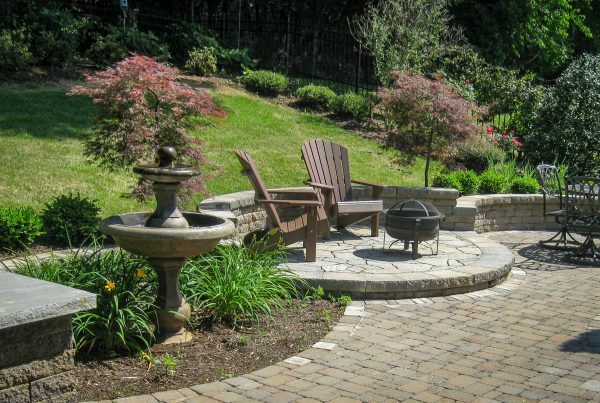 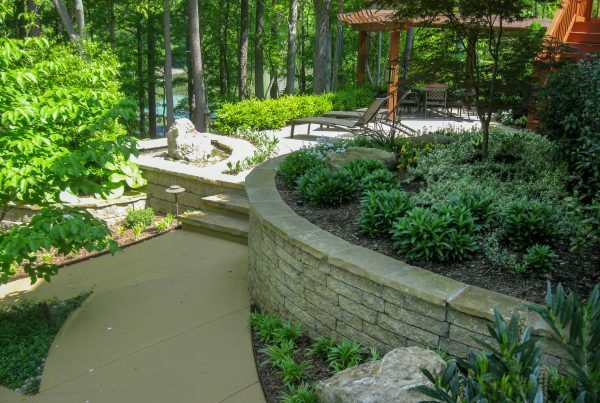 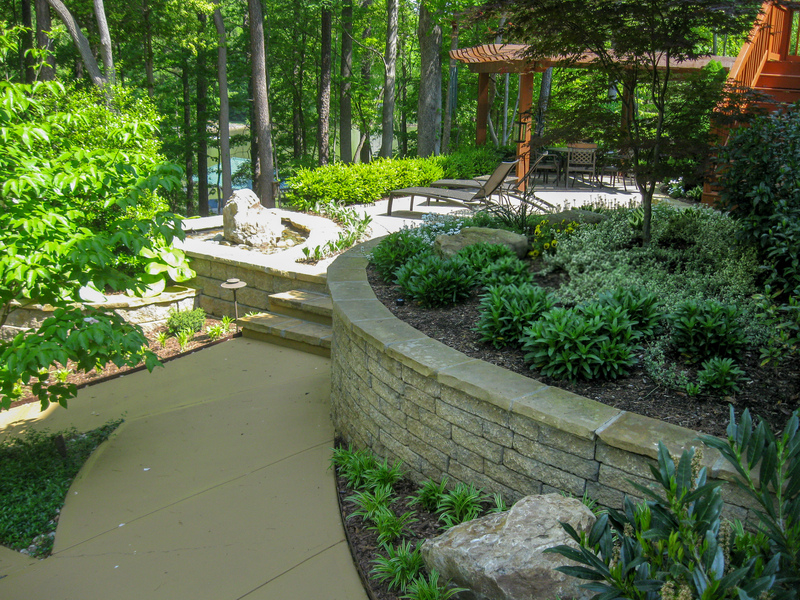 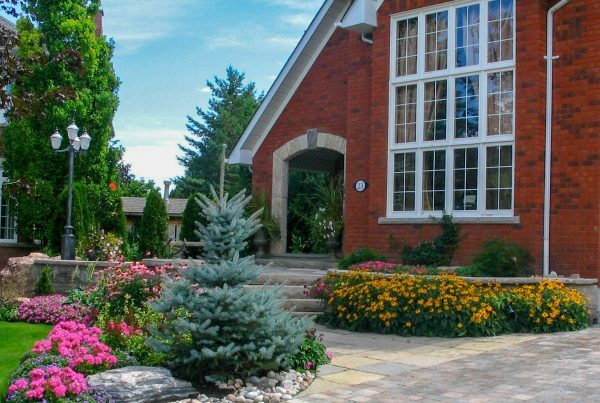 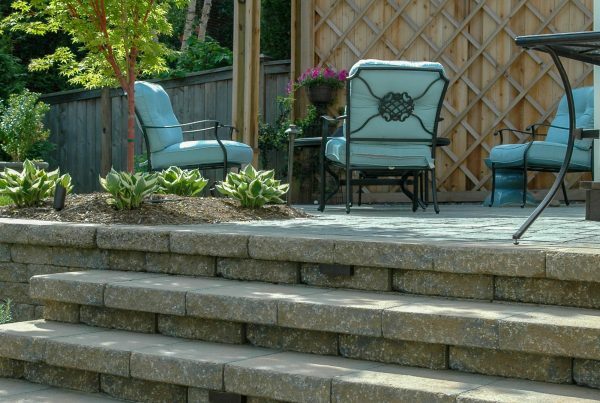 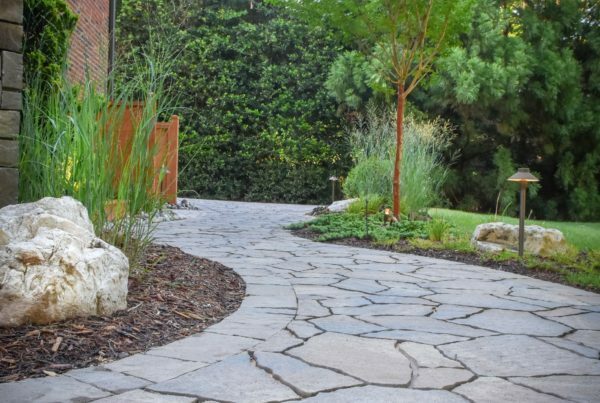 Whether it is a walkway, steps, a patio or a stepping stone walkway in stone or concrete pavers, the certified design consultants at DeSignia have what it takes to integrate these features into your landscape. 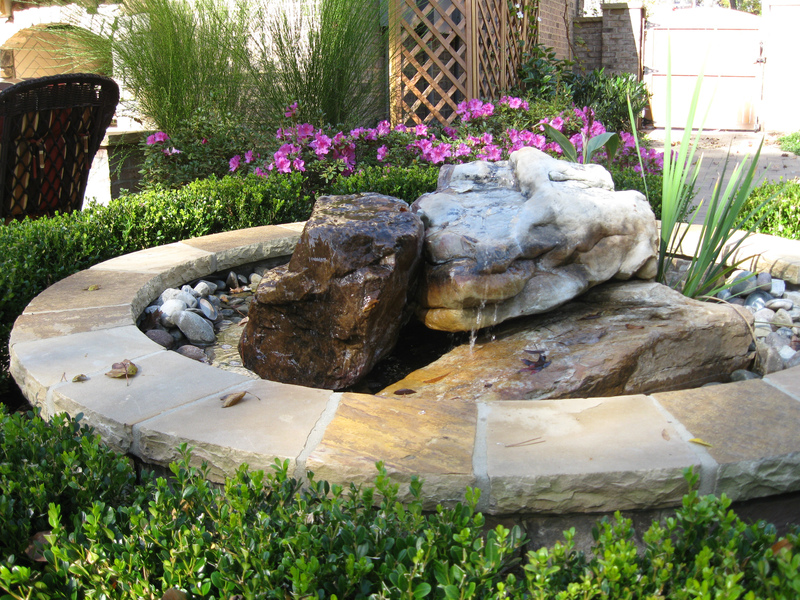 At DeSignia, nothing is done without considering aesthetics. 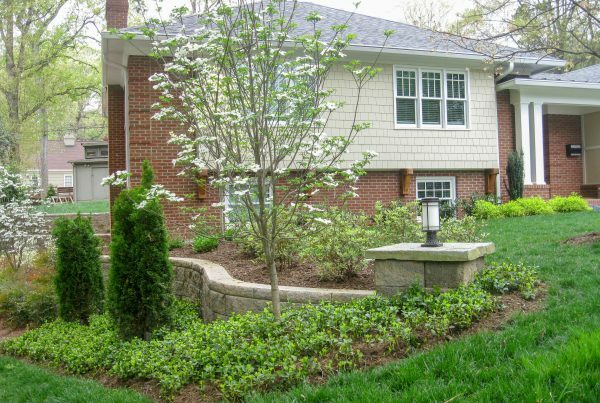 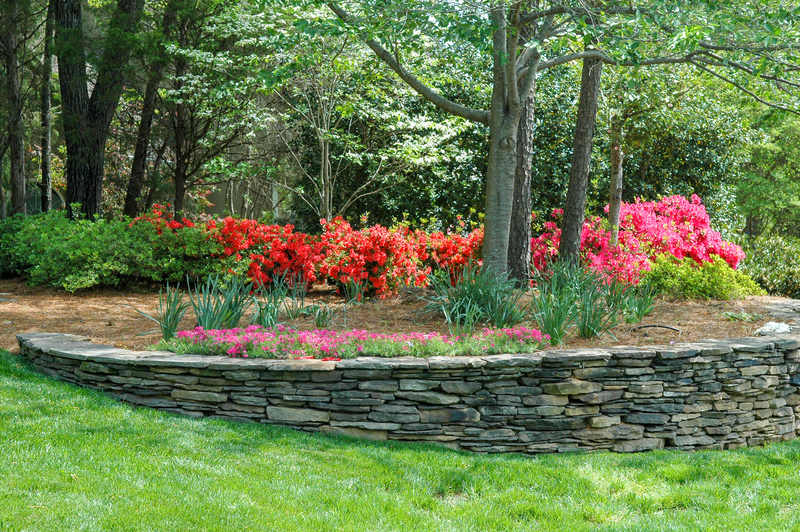 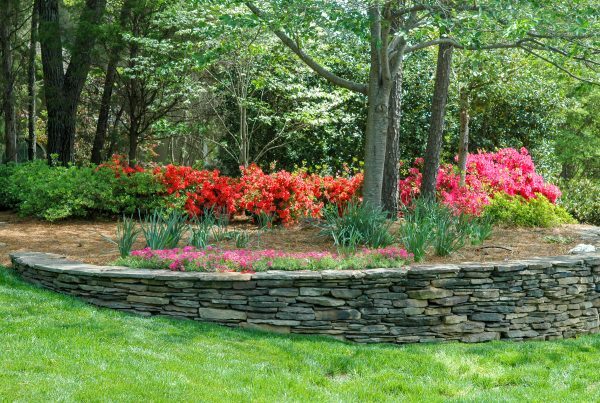 When a retaining wall becomes necessary, it can add a significant cost to a landscape project. 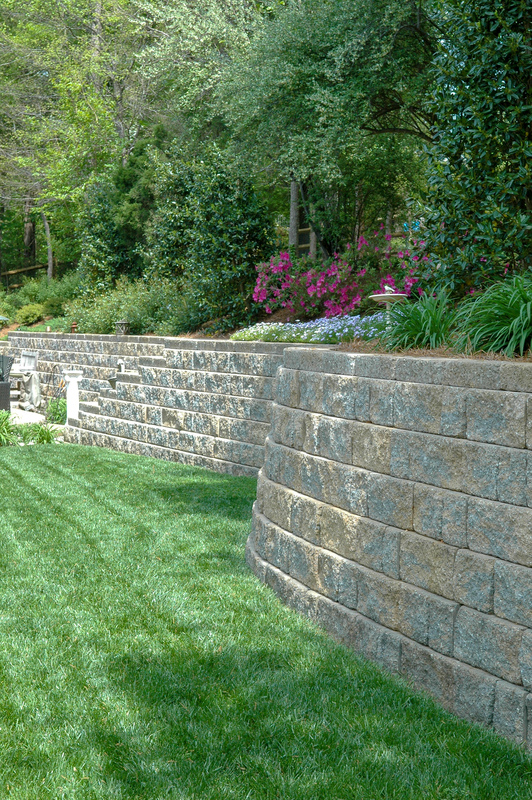 It is vital that the wall is engineered and installed to last for a very long time. 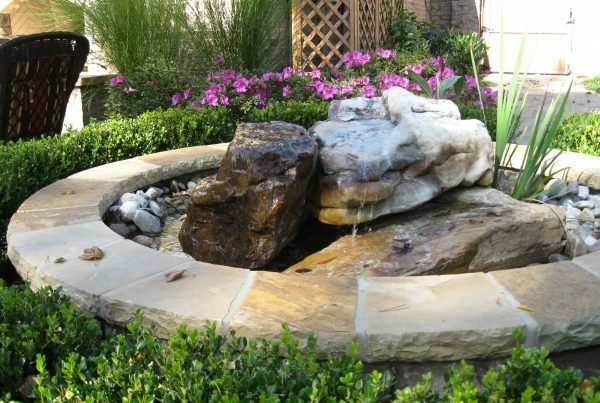 Add to this our aesthetic approach, and you end up with a very solid combination of beauty and function. 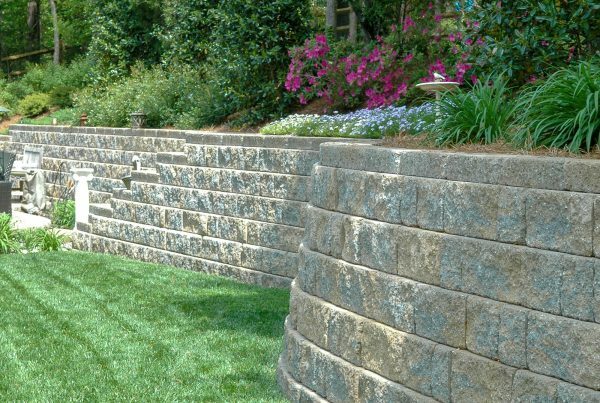 We will recommend, design and build the wall that fits the plan and budget. 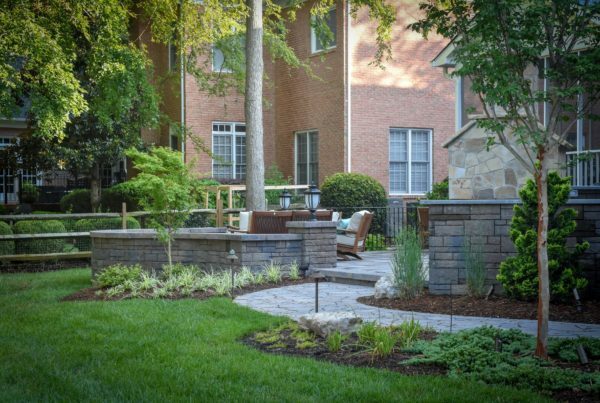 This rapidly popular landscape environment is an exciting way to bring the indoors outdoors. 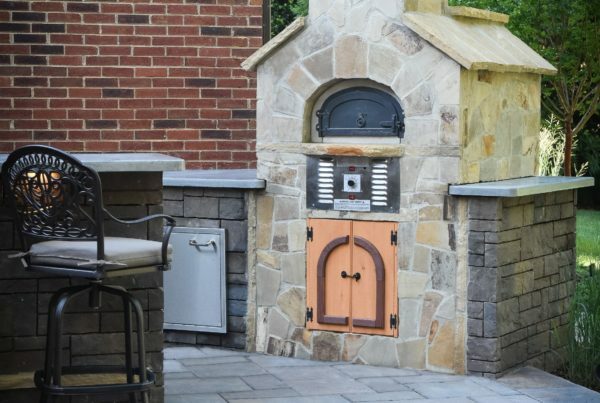 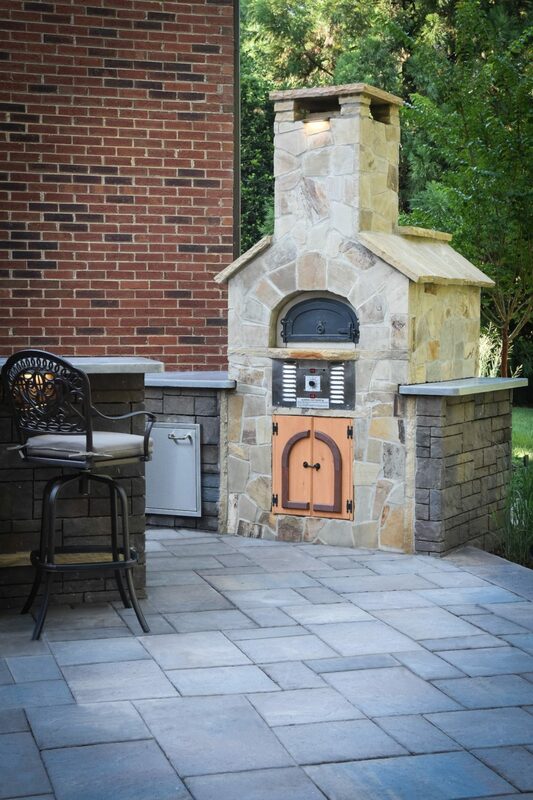 From built in grills and pizza ovens to outdoor refrigerators and entertainment centers, an outdoor kitchen environment set within a properly designed landscape can create an unbelievable atmosphere for gatherings and family time in the fresh air. Drainage is one of the most overlooked aspects in the landscape. 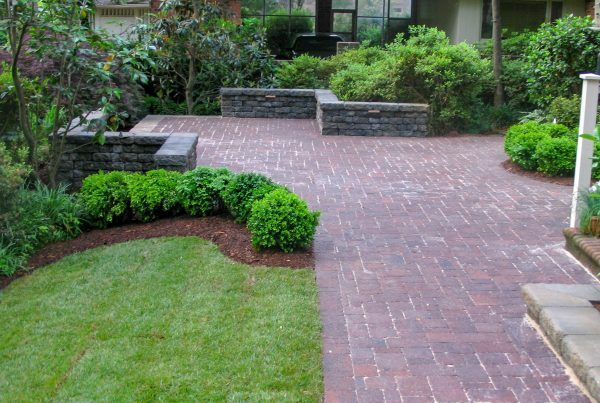 Poor drainage can cause a variety of problems ranging from poor plant performance to failing hardscapes. 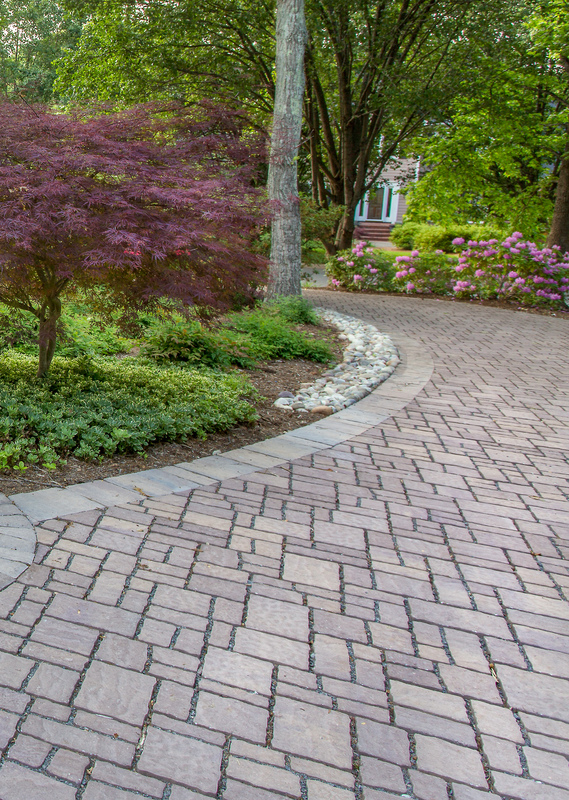 DeSignia takes a very serious macro approach to drainage in any project. Creating drainage solutions that can deal with heavy rain events is a must for a complete and sustainable landscape project and are an integral part of our comprehensive design approach.